Over the past twenty years, the number of running events has increased exponentially year on year; and that’s before you count all the increasing popular trail, ultra, mud, obstacle, paint, electric, fancy dress etc options too. And with that increase in events, has come the rise of the professional events companies that put them on. Ever considered how much it costs to stage an event? It can be astonishly expensive even to operate a mid-sized race. Everything costs money. Infrastructure, road closures, policing, security, parking, race village, toilets, online entry process, website, chip timing, insurance, medical cover, food, drink, medals, t-shirts, bananas, printing, pens, bits of tape, blutack, ink…A race directors list of costs can easily run to several hundred different lines, most of which the average runner wouldn’t even think of. The big companies spend hundreds of thousands on such items, but they need mass participation to pay for it all. Events companies are businesses, with staff and bills to pay. And therefore they understandably need to make a profit. When you are charged £40 – £50 these days to run a half marathon and just assume that it is shameless profiteering on behalf of the organiser, you might actually be mistaken. Not always admittedly, but sometimes big races are run at a loss which might surprise you. So what are the implications of the other type of race. The one run by the local running club? The race that has existed for the past twenty or thirty years, long before the rise of the professional events company. Well they are faced with exactly the same costs, but without the economies of scale that the big companies enjoy, and without the mass participation element to provide the money up front. So to save on costs and to keep your entry fee as low as possible, their only choice is to cut out some of the non-essential costs. Such as t-shirts. Or food at the finish line. 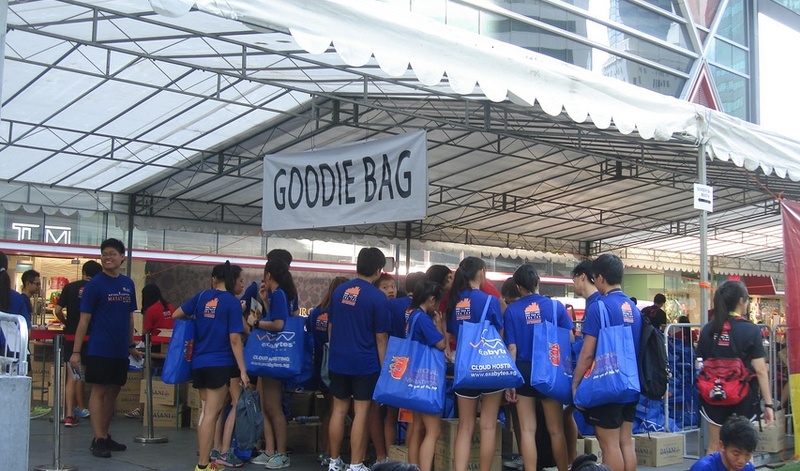 Or goody bags. For the casual runner who only usually enters the big events, they can get pretty animated if the same fare isn’t on offer as the 35,000 runner event they did last time. The problem is that the bar of expectation has been raised too high. The indignation of not receiving a technical hand-stitched branded t-shirt needs to be balanced against fact that a couple of hundred pounds can be the difference between staging or not being able stage the race at all. Indignation should perhaps be better directed at the councils and police services who these days see running races as a healthy source of income, and will do little to soften the blow by reducing the huge charges they levy for allowing an event to take place on public roads on a Sunday morning. What was considered standard years ago, rarely cuts the mustard these days. A start line, a finish line, an accurately measured course, and a precise race time used to be enough. Sound familiar? Well isn’t that what parkrun provides every week? 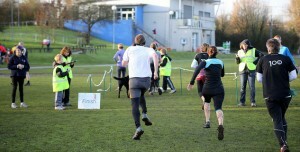 Sure, parkrun is a fabulous concept and quite rightly is hugely popular. But one of its biggest draws is that it is free to enter. How many these days would be prepared to pay an entry fee and at the same time expect exactly the same format. Race organisers therefore cater for the majority. Skimping on the bonus items at the finish line would dissuade too many. No t-shirt or goody bag; good luck with that. No medal; you’ll be slaughtered. Not enough toilets; put on your tin hat and brace yourself. Could you cope without one after a race? 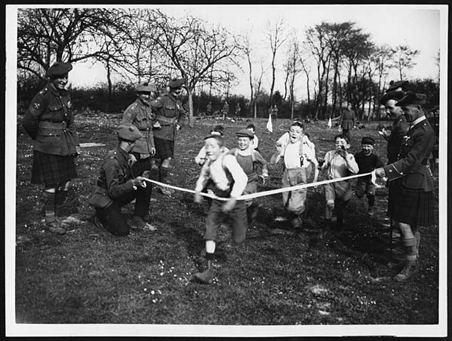 Of course we’re not advocating going back to the eighties where only elite men in their string vests and tracksters need bother sending an application with their postal order, to run round a field for nothing more than a cup of water and their result printed in the local paper seven days later. Merely that we occasionally lower our expectations and treat races for exactly what they are, ie. running races, rather than than hoping for 2014 rewards for 1980s prices. 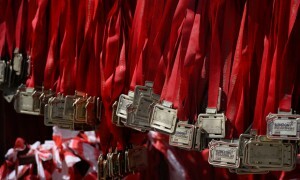 I do believe a medal to record the finish is a good momento and most would welcome. A drink and small item to eat at the end is also very welcome. Other than that, the “goody bags” often disappoint and I would prefer not to get them. Any funds raised in entry fees should be invested in the organisation and support for the event. As for the shirts etc why not have an event one available to buy with a promotional discount offered by the brand for a future purchase. I agree completely with the sentiment here and I think that is because I have matured a bit as a runner and I’m not interested in trinkets and t-shirts anymore. However when I started running 8 years ago, I wanted the affirmation that a t-shirt and medal seemed to provide. And I knew nothing about organising a race. Now that I have grown up a bit, I realise that I am looking for the experience rather than a bag full of stuff at the end. So I suggest that what will happen is that the newbies will flock to the mass participation races with their medals and free beer at the end and ‘real’ runners will go to races which are unashamedly low-fi. Horses for courses. I just don’t get the obsession with medals. Fair enough if it’s gold, silver and bronze for the first three places, but why should everyone get a medal just for taking part in a sporting contest? We all complain about the trend in schools to have less competition, with no winners and losers and everyone treated the same. What’s the difference between that and handing out a medal to all runners in an event regardless of their finishing time or position? Having a medal is fine for ten year olds, but seriously adults…..get a grip! If you want a memento of the race, just keep your race number and write your time on it, or buy a race photo. 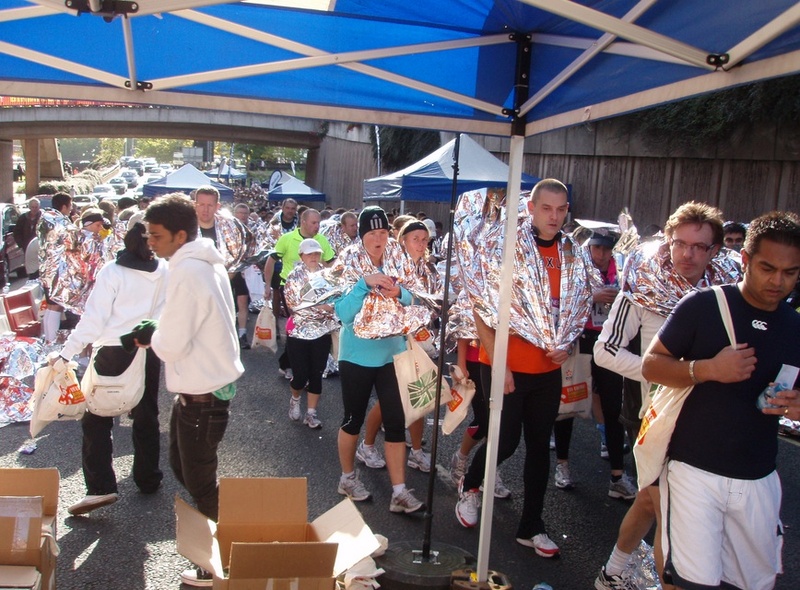 We organise these events because we’re passionate about delivering great running events.